Real Value Productions is a San Francisco Bay Area music production company producing compact discs, mp3 downloads, studio session work, and soundtracks for your film projects. 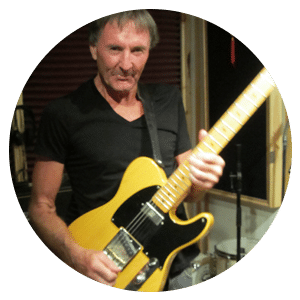 Writing / composition responsibilities are handled by Paul Kelley, guitarist, with a revolving line-up of Bay Area studio musicians collaborating in the recording process. After witnessing years of endless wars and economic decline to benefit a handful of ‘too big to fail’ wall street gambling houses, Real Value Productions was started to provide ‘real value’ to the American cultural landscape, and lift the American spirit a bit. The concept: “Creating new music – innovative and marketable, yet rebelliously challenging, that speaks more to liberation than cloning. Take the energy of early American roots rock and roll, add the complexity of fusion / classical / odd timings, but maintain soul and rhythm”. Mark Stefani: studied jazz theory and guitar technique. Matthew Montford: studied fusion guitar and African and Indian rhythm training. He is the author of Rhythmic Training through the traditions of Africa, Bali and India. Keith Murphy: studied classic rock and fusion guitar. He is the former guitarist for ‘The Loading Zone’ a late 60’s SF rock band. Jerry Gerber: studied classical composition and counterpoint. Currently: Studying chromaticsm, particularly as it pertains to the work of Bela Bartok. After the financial crash in the United States starting around 2007, and doing some investigation into the hows and whys of that, I became convinced that all financial markets in the United States are rigged, and decided I would start this music production company as a means of investment in my own future, and the future of a resurgent United States economy. I have developed relationships with various bay area studio musicians from years of being in and out of the local music scene, so I have a great local talent pool for help in producing cd’s of new music, both players and production personnel.